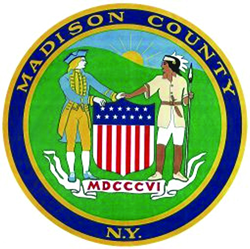 Madison County is a county located in the U.S. state of New York. As of the 2010 census, the population was 73,442. Its county seat is Wampsville. The county is named after James Madison, fourth President of the United States of America. Indigenous peoples had occupied areas around Oneida Lake for thousands of years. The historic Oneida Nation was an Iroquoian-speaking people who emerged as a culture in this area about the fourteenth century and dominated the territory. They were one of the Five Nations who originally comprised the Iroquois Confederacy or Haudenosaunee. English colonists established counties in eastern present-day New York State in 1683; at the time, the territory of the present Madison County was considered part of Gloucester County, both containing territory now included in the state of Vermont. On March 12, 1772, what was left of Albany County was split into three parts, one remaining under the name Albany County. One of the other pieces, Tryon County, contained the western portion (and thus, since no western boundary was specified, theoretically still extended west to the Pacific). The eastern boundary of Tryon County was approximately five miles west of the present city of Schenectady, and the county included the western part of the Adirondack Mountains and the area west of the West Branch of the Delaware River. The area then designated as Tryon County includes 37 current counties of New York State. The county was named for William Tryon, the colonial governor of New York. In the years prior to the outbreak of revolution in 1776, tensions rose in the frontier areas upstate and most of the Loyalists in Tryon County fled to Canada. In 1784, following the peace treaty that ended the American Revolutionary War, New York changed the name of Tryon County to Montgomery County, in honor of the general, Richard Montgomery, who had captured several places in Canada and died attempting to capture the city of Quebec. As allies of the Patriots, the Oneida Nation was allocated land by the United States in the postwar settlement for a reservation near Oneida Lake, in their traditional homeland. In the postwar treaty, the four Iroquois nations who had been allies of the British were forced to cede their lands; most of their peoples had already migrated to Canada to escape the worst of the fighting on the frontier after Sullivan's Raid. This expedition through Indian country had destroyed dwellings, crops and winter stores; many Iroquois who did not migrate died of starvation that winter. But settlers were hungry for land, and in 1788 Governor Clinton's representatives persuaded the Oneida to cede some of their territory to the state for sale to European-American settlers. This was called the "Clinton Purchase", after Governor Twenty Townships, as these were the number organized after New York controlled the land. As this sale was never ratified by the United States Senate, it was declared unconstitutional in a ruling by the United States Supreme Court in the late twentieth century. New York State had no legal authority after the Revolution and the formation of the United States to negotiate separately with American Indian tribes. In 1789, Montgomery County was reduced in size by the splitting off of Ontario County. This was later divided to form the present Allegany, Cattaraugus, Chautauqua, Erie, Genesee, Livingston, Monroe, Niagara, Orleans, Steuben, Wyoming, Yates, and part of Schuyler and Wayne counties. In 1791, Herkimer and Tioga counties were two of three counties split off from Montgomery County (the other being Otsego County). 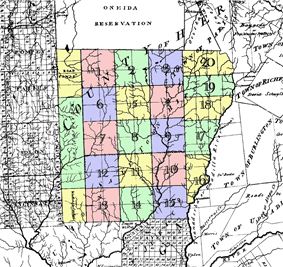 Chenango County was formed in 1798 from parts of Tioga and Herkimer counties. Finally, Madison County was created from Chenango County in 1806. About 1802, the Oneida agreed to allocate about 22,000 acres of their land to the Stockbridge and Munsee (Lenape), who were seeking refuge from anti-Native American conflicts by American settlers after the Revolution. Both were Christianized: the Stockbridge had migrated from western Massachusetts and the Lenape from New York and New Jersey. The two peoples were pressured to leave New York for Wisconsin in the 1820s, to make more land available for European-American settlement. In the late twentieth century, the three recognized Oneida tribes: of Wisconsin, New York, and the Thames reserve in Canada, filed suit in a land claim against New York State for its treaty and forced purchase of their ancestral lands after the American Revolutionary War, seeking return of thousands of acres. The US Supreme Court has ruled the purchase was unconstitutional, as New York did not have the treaty ratified by the US Senate, and had no authority under the US Constitution to deal directly with the Oneida, a right reserved to the federal government. In 2010 the state offered the Oneida Tribe of Wisconsin more than 300 acres in Sullivan County in the Catskill Mountains, with permission to construct a gambling casino, and 2 acres in Madison County, to settle their part of the suit. Several private and public interests oppose the deal, including other federally recognized tribes in New York. Oneida Lake and Oneida Creek define part of the northern boundary. The Great Swamp, formerly located south of the lake, was a rich wetlands habitat important to many species of birds and wildlife. This was drained by local and state construction projects in the early decades of the twentieth century, chiefly by Italian immigrants. The fertile soil supported high production of onions and other commodity crops, and the Italian families grew wealthy from their work. The area was known as "Black Beach" for its mucklands. Chittenango Creek defines part of the western boundary. Label in parentheses indicates official political level. As of the census of 2000, there were 69,441 people, 25,368 households, and 17,580 families residing in the county. The population density was 106 people per square mile (41/km²). There were 28,646 housing units at an average density of 44 per square mile (17/km²). The racial makeup of the county was 96.49% White, 1.32% African American, 0.52% Native American, 0.56% Asian, 0.01% Pacific Islander, 0.26% from other races, and 0.84% from two or more races. Hispanic or Latino of any race were 1.06% of the population; 16.1% were of German, 15.6% English, 15.5% Irish, 12.1% Italian, and 8.0% American ancestry according to Census 2000. Of these 95.6% spoke English and 1.9% Spanish as their first language. There were 25,368 households out of which 33.60% had children under the age of 18 living with them, 55.10% were married couples living together, 9.70% had a female householder with no husband present, and 30.70% were non-families. Of all households 24.50% were made up of individuals and 10.30% had someone living alone who was 65 years of age or older. The average household size was 2.55 and the average family size was 3.04. ^ Barbagallo, Tricia (June 1, 2005). "Black Beach: The Mucklands of Canastota, New York" (PDF). New York Archives. Retrieved 2008-06-04. Barbagallo, Tricia (June 1, 2005). "Black Beach: The Mucklands of Canastota, New York" (PDF). Retrieved 2008-06-04.